As a first year electrical apprentice I was sent to Port Hedland in 1960 to carry out the electrical work on a large group of new State houses being built by George Thompson. I was left by myself to do the work, lived at the Esplanade hotel, and really looked after by a couple of the site carpenters. George Thompson built the houses in the old main incoming street Anderson I think, also some in Sutherland St overlooking the beach where we built a fish trap of fence posts and wire fencing. We would wait for the tide to go out and then nearly always had a choice of the fish to eat, caught turtles and other things as well. I remember the painting contractor Jimmy Nicolakis from Geraldton rowed a dingy over to Finucane Island and came back with the greatest array of large and coloured sea shells. I added lights and bases to some of them and gave them away as presents. After completing the State houses, we upgraded St Cecilia’s Convent and Father O’ Sullivan presbytery before he left for Good. By the way because I had spare time on the job I did the mail run into town each day and got some small items for the carpenters from Elder Smith. One day the police sergeant asked me would I give him a lift back to the station. There he said come in Graham, what for I asked……so I can give you a drivers license….was his reply. One day I met the Bill and Flo Kane’s family from Kingsmill Street, Port Hedland. Bill Kane on the far right, PH Airport. In my spare time I was allowed to help Bill refuel the aircraft at the Port Hedland Airport so got to know one of the best men of the Pilbara. Bill Kane owned and trained RED WARRIOR, the best horse to race in Port Hedland, ref. Ron Solly. I remember Bill well because once a month an old Aboriginal mate of his would walk in from the De Grey for his pension payment. Before leaving he would go to see Bill, do a little garden weeding and be handed a large meat and salad sandwich with one only large bottle of Swan Lager. Bill would sit by his side under the shade of a tree and it was so clear how much they meant to each other. Bill must have told him I was a new migrant so the next thing was an invitation to attend a corroboree going to be held on the De Grey River bed to bring a young man into adulthood. What an great invitation this turned out to be. We sat a good distance away from the actual scene but could clearly see and hear all the ceremony. This night made me realise what a great gift we have in having such wonderful people alongside us. I have just read Jack McPhee’s life story and learned how cruel and uncaring our early government institutions were to all these people especially in the Pilbara. The best any white person can do is to give our Aboriginal brothers and sisters a big smile and a handshake when possible. The Port Hedland Historical Society has written a brief on the history of South Hedland, post code 6722. The oldest history of South Hedland can be seen in its signature pundul trees. These trees are remnants of Gondwanaland forest, from before the ice ages, more than 2 million years ago. In aboriginal mythology the pundul were the source of maparn, or special powers. In 1968 Port Hedland Shire Council resolved to establish the residential area of South Hedland. The name was approved in 1969 and the town was gazetted in 1973. Building infrastructure commenced in South Hedland in 1970. The State Housing Commission was responsible for the construction and selected town planners Dr A Comar and Associates. The plan for the area was based on Radburn, with houses facing inwards to footpaths to give safe, walkable access to the schools and shops. That meant visitors arriving by car would enter in the back door of the home. To most locals including elected councillors at the time, the design was a complete disaster. 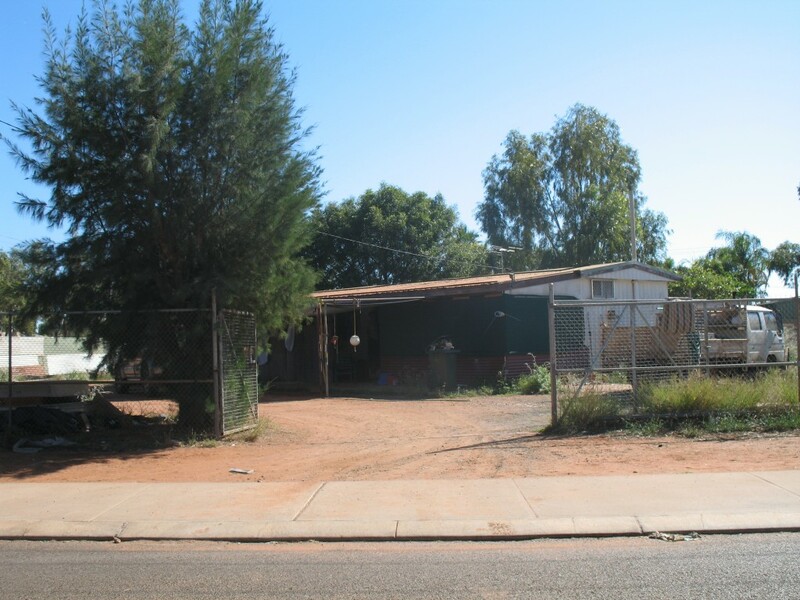 The first house built in Lawson, the first cell of South Hedland, is located at 46 Pedlar Street (Ref. Peter Starling). By 1972, there were 250 houses in Lawson along with the South Hedland caravan park next to the football oval. This bold design experiment came under fire by the Shire’s building surveyor, Mr Ron Britten. He said it was a “tragedy of design” that wouldn’t have been approved by the Town Planning Board. The back to front houses offered little streetscape to the locality, the design was inefficient for travel and provided little relief from the heat. A review of the plan in 1974 found that while Corboys Place in Nucleus 1 was only 400 metres away from Bottlebrush Crescent in Nucleus 4, a vehicle journey between the two would be about one and a half kilometres. A significant redesign was called for to build easier connecting roads and streetscape appeal. Significantly, the Pilbara got its first high rise flats in South Hedland, the tallest residential building between Perth and Darwin. 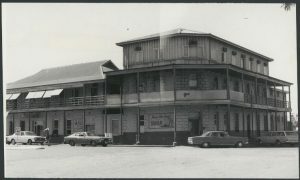 The flats were purpose built for Mt Newman Mining’s single men’s quarters. South Hedland continues to be an experimental residential area of the Shire of Port Hedland. Its transformation from back to front housing with little street appeal, to newly built amenities which are under pressure to deliver, makes South Hedland an intriguing place to study with all its complexities. A visit to South Hedland is a must for all current and future town planners in local government. Some Housing Experiments on Radburn Principles, J Lewis Womersley, 2011. In 1962, Port Hedland was a sleepy little port with around 1,500 residents. A new postal officer arrived in town. It was none other than Colin Peter Matheson. Included among the matches were challenge games against Marble Bar and Goldsworthy. It was after one of these matches that Colin Matheson and the President of the Marble Bar Football Association discussed the possibility of forming one association. In 1971 Marble Bar disbanded. 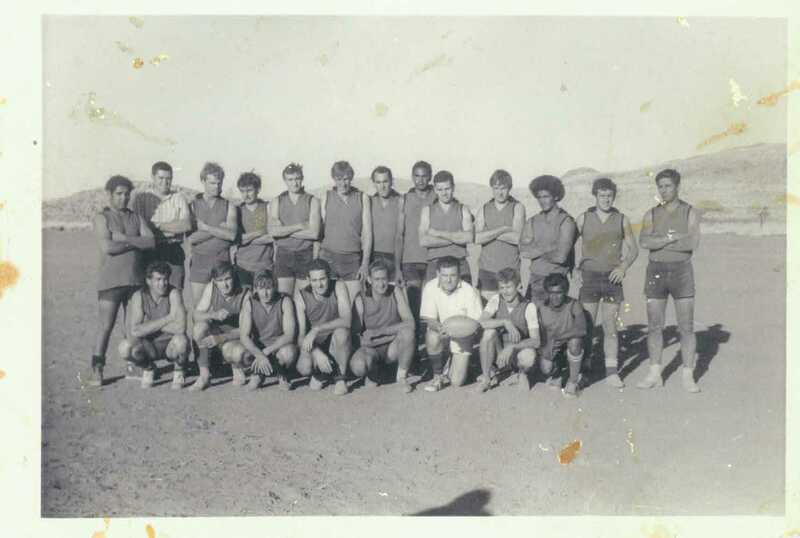 In 1977 the De Grey Football League (formed by Colin Matheson) and West Pilbara Football League combined to form the De Grey West Pilbara Football League under separate constitutions. In 1983 one constitution was agreed to and the name changed to the North Pilbara Football League. Find out more about history of #Pilbara #football in Colin Matheson’s book “Johnny Come Lately”,1997, available by post for $20. Contact the editors of this site for more information. 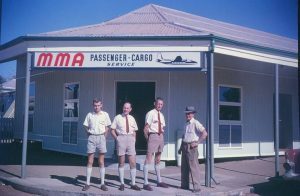 A significant event for the Town of Port Hedland was the air crash of a MacRobertson Miller Airlines on 31 December 1968. My father Colin Matheson was called to the crash site to take photos (the one above) as a reporter for The West and the Hedland times. Some history records show that twenty one passengers and five crew were killed in an incident caused by “a fire” in an engine. The plane was found at Indee Station near Port Hedland. The aircraft was under the command of Captain B.B. Bayly and the crew consisted of First Officer M.J. Nelson, Senior Hostess G.F.J. Bradshaw, and Hostess G.P. Sweetman. There were 22 passengers on board the aircraft including Miss K.M. Aubrey who, although travelling on a passenger ticket issued by the Company, was on board as part of familiarisation training as an air hostess. “The cause of the crash was not fire, but a result of the right wing braking away from the fuselage. 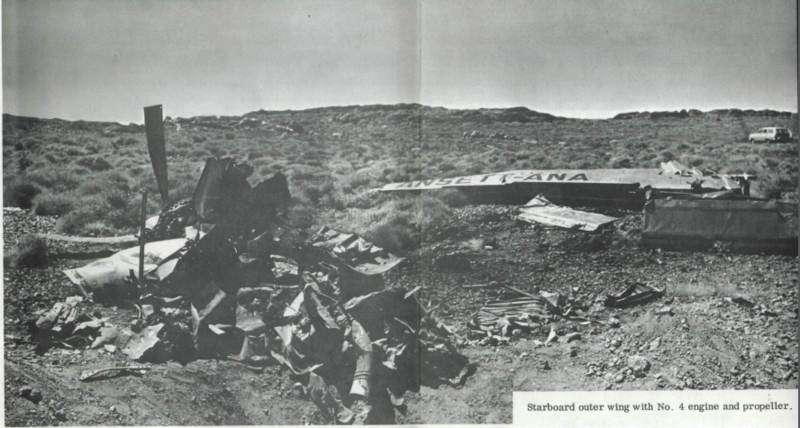 This section of the aircraft was found nearly 1km from the main crash site. Apparently a bush had been inserted incorrectly during a service of the aircraft and this developed into metal fatigue. I can still clearly remember ringing your Dad, who was the correspondent for the ABC and The West and telling him what had happened. The Pilbara is a beautiful spot, even the town of Wittenoom. Philip Schubert first went to the Pilbara in 1959. This film was shot by his Father and shows Port Sampson and Wittenoom. Dales Gorge was virtually unknown then. Philip is the small boy in the film. The film also shows a truck travelling on a road carrying asbestos. It’s not hard to notice the asbestos tailings casually by the side of the road near the race track. 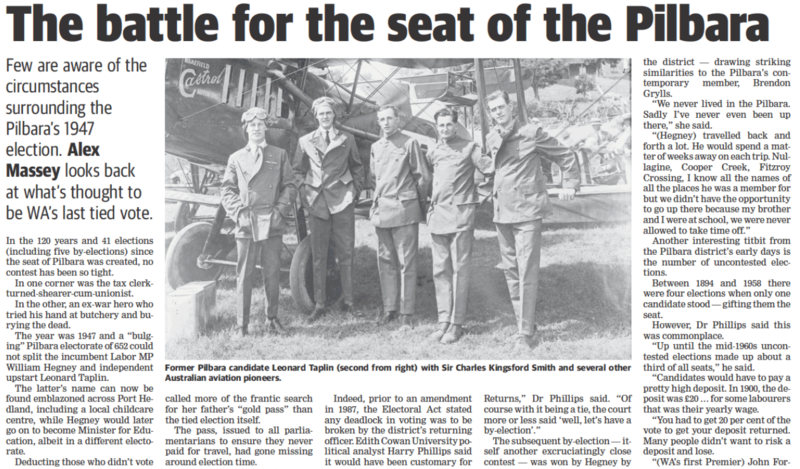 Alex Massey writes about the 1947 Pilbara elections in the North West Telegraph, 27 March 2013, p. 19. In 1947, the seat was marginal. Len Taplin won it in the end. 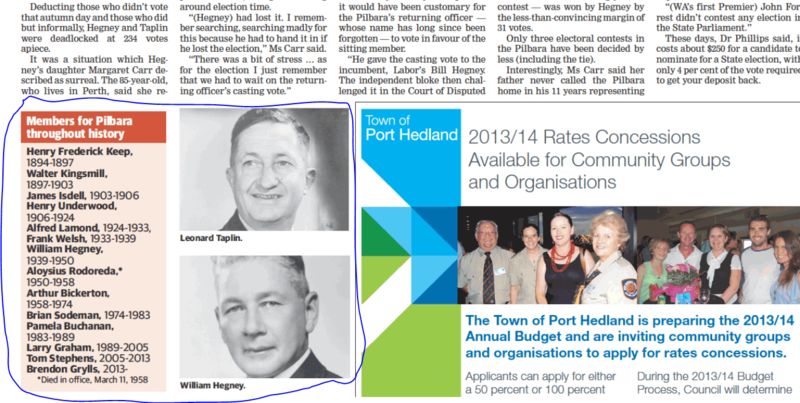 The article captures the election history of those who have represented the Pilbara. Joan Foley‘s letter to the NWT 27 Mar 13 reminds me of my dad, Colin Peter Matheson’s last 6 months on this earth. 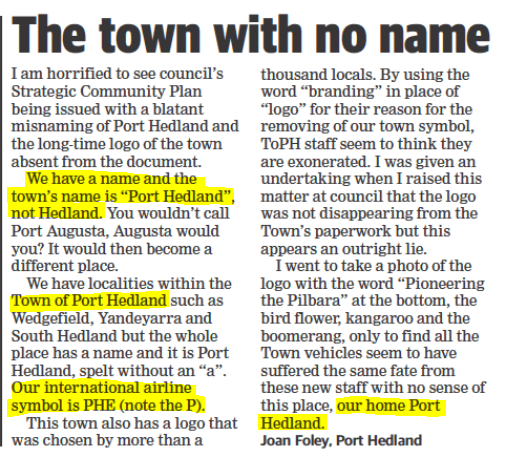 He too was a vocal opponent of the Shire’s reference to Port Hedland as “Hedland”. In 1995 the Town of Port Hedland was planning the 100 year celebration of Port Hedland ready for 1996. Dad could see that all of the branding was to be “100 years of Hedland”. He was furious. So furious, he went to visit a lawyer in Karratha to hatch a plan to stop it. The plan was to change his business name from North West Distributors to 100 years of Hedland. He then requested the lawyer to write to the Shire and demand they desist from using his registered business name in any of their branding or marketing. There was much resistance from the Shire. In the end my dad prevailed. Unfortunately dad never saw the celebrations. He died in his sleep on 10 January 1996 – the year of 100 years of Port Hedland.